NAB may change, but I’m still here. Honestly, I’m not sure of the answer, but I shudder to think. It’s more than I’d care to admit – but if I spent any time dwelling on it there would be one good outcome, and that would be the opportunity to think about the unexpected, challenging and eye-opening ways that my career has developed. 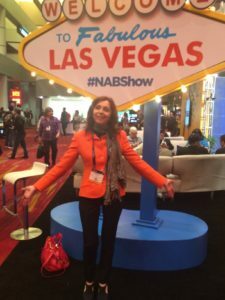 At my first NAB – which let’s just say was a little while ago – I was still working for an Italian Broadcast Distributor and was eager to learn about DVEs, cameras, mixers and such. Seems almost quaint now, this fixation on hardware. But back then I was really into hardware and was passionate about the physicality and logic of a real, physical unit in front of you. I loved understanding how something tangible worked and the very practical dimension involved in problem solving. Hardware was, and still is, immensely satisfying. For the next few years NAB saw me as an exhibitor. I recall the fatigue of the build-up and tear down of the booth. My colleagues and I would start the show feeling exhausted but there was always an energy – an electric charge – that would surge through us when we closed. ‘Closing’ was of course a very different beast then – there were physical products that the client might literally walk away from the booth with, and ‘show specials’ were a common thing – for astronomical amounts of money, unthinkable in today’s industry. Excitement was also high if we ever made it through a demo without a fatal crash – I can’t imagine even the smallest mistake being tolerated at today’s NAB. On the physical side I suffered from standing all the time – high heels, aching back, but as they say, ‘work hard, play hard’, and you would never see me pass on the opportunity to dance all night. I am sure some will remember Nolan (my soul mate and dance partner who died some years ago) and I dominating the dance floor… After all, endorphins can cure any foot ache! Eventually I came back to NAB as a visitor consulting with exhibitors. 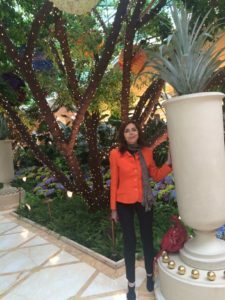 Still passionate about technology; not repairing hardware any longer but writing about industry developments and consulting on digital communications; still meeting my industry friends and colleagues (some with grey pony tails and some with short hair) and still walking around in high heels. But whilst I haven’t necessarily let success get to my head, there is one small concession that I allow myself; nowadays you’ll only find me in hand-made shoes from Italy. It isn’t vanity (OK, maybe a bit). And it isn’t heritage (OK, maybe a bit of that too). It’s really simple strategic good sense – if you had endless exhibition halls to cover over five days, you’d spend more on your shoes than your tech too! It feels like everything has changed, and nothing has changed. I still know all the old faces, but it has taken diligent study to ensure that I remain at the cutting edge of developing technologies in the field. I’m not selling a product anymore, but I am working to be sure that as many people as possible know of my team’s PR and marketing skills and get to appreciate our reputation, knowledge and expertise. The NAB PR campaign started in February and it will end at the end of April. A very intense process but this is part of being perfectionist, chronically curious, caring for details, for people and relying on all the journalists and industry friends who have accompanied me in this amazing industry so far. So I hope to see you at NAB. As always I will be the ambulant Italian firecracker, dressed in a burst of red or orange. Because if there’s one thing that remains, it’s my fiery Italian heritage and my ongoing passion for the broadcast industry. NAB may change, but I’m still here.